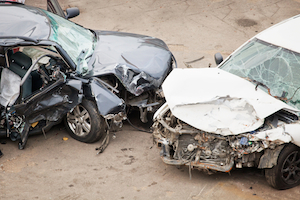 Head-On Collisions | Nashville Car Accident Lawyers The Law Offices of John Day, P.C. A head-on collision is perhaps the most violent type of car accident. With two cars or trucks hitting one other from opposite directions, the impact forces each person in the vehicles experiences is extremely severe. Head-on collisions are rare and estimated to be only 2% of all accidents, but the trauma involved is so high that head-on crashes account for 18% of all fatal wrecks other than at intersections. Some head-on collisions occur when one driver crosses the line while trying to pass a slower vehicle. However, the vast majority of head-on accidents occur when one driver just drifts into the lane of oncoming traffic while driving straight or negotiating a curve. The force involved in a head-on collision is even more significant when one of the vehicles is much larger or driving much faster than the other, as in the case of a tractor-trailer hitting a passenger car. If one vehicle in a head-on crash has more force because it weighs substantially more or is moving substantially faster than the other vehicle, the lighter or slower vehicle may actually be knocked backwards in the crash. The combined force of being jolted to a stop and then bouncing in the opposite direction almost instantly will even further increase the trauma endured by anyone in a lighter or slower vehicle. Tennessee law on car accidents begins with the idea that all drivers must act with due care at all times, and do what they reasonably can under the circumstances to avoid an accident. Drivers’ responsibilities include getting off the road if the driver is too tired to stay awake, and maintaining their vehicle to make sure the tires are not too slick to safely take curves on roads. Tennessee law requires every driver to stay on the right side of any two-lane road unless an exception to the rule applies. Of course, drivers must stay on the right half of the road whenever approaching another vehicle heading in the opposite direction. Proof of which driver crossed into the wrong lane of traffic can be done through testimony of the drivers involved in the crash, any passengers in the vehicles, and any bystanders who saw the wreck. In more complex cases, an accident reconstructionist may be called as an expert witness to testify about what probably happened based on physical evidence at the scene. Accident reconstructionists base their testimony on skid marks, where on the road the two vehicles came into contact, which parts of the vehicles show damage and how much damage each vehicle sustained, data from the vehicles’ on-board computers about how fast each vehicle was traveling before impact and when each driver pressed the brakes, and any other available evidence. Our experienced attorneys have represented victims of head-on collisions throughout Tennessee. If you or someone you know would like our help, please contact us online. Call us anytime at 615-742-4880 or toll-free at 866.812.8787. Because of the need to quickly investigate and appropriately document and preserve any physical evidence, do not delay. Contact us today.